It looks like The Killing is dead — for a second time. Deadline reports that AMC has cancelled the crime drama once again. The cable channel cancelled The Killing last year after the ratings sagged in season two. Fox Television Studios was ultimately able to make a new deal with AMC and Netflix that resulted in a third season being ordered. Despite having the support of some devoted fans, the ratings didn’t grow in season three and actually fell a bit. Season two garnered 1.58 million while season three averaged 1.52 million. 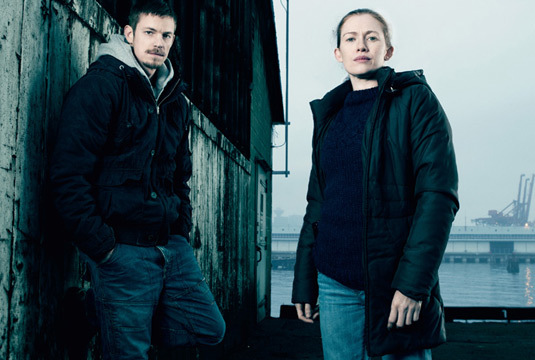 Word is that Fox may try to find a new home for The Killing once again but it seems unlikely that the series will be saved a second time. What do you think? Will you miss The Killing? Was season three as good as the first two seasons? Did you lose interest? Would you have watched season four? The most wellacted and written show on Tv, of course it would be cancelled. Although season 3 was dark and kind of depressing, it was a GREAT show. The characters, the story and the scenery – wonderful. Not surprised this show was canceled. It was too brilliant and well acted for television. RIP: Holder and Linden! Two of the best characters to ever grace the television screen. I will keep my fingers crossed, in hopes that Fox will find a new home for one of the most well acted, intriguing, powerfully emotional, intelligent, and exceptional dramas ever! Can’t believe this is getting cancelled and Hell on Wheels which lacks any sort of direction or coherent plot gets to plod along. Why do good shows get canceled and yet reality crap lives on. Haven’t seen the third season yet, what’s up with that Netflix (Canada) you partnered up with fox to produce a third season. Guess I’ll have to download it then. What needs to be cancelled is the people making the decision to cancel one of the best programs on TV. Hopefully anther station with a little more for sight will pick it up. Some times I wonder who makes these stupid decisions. If you plan to cancel the program just when it gets interesting, why bother to put it on the air in the first place. Great show, would absolutely watch every episode of Season 4. I was a little troubled by the ending though. How was Enos’s character going to come back from murdering a fellow cop? Nooooo Why ???? I love this show !